GtBank is rewarding its loyal customers who use the *737# code to recharge a N10,000 worth of Airtime when you recharge your Sim card. 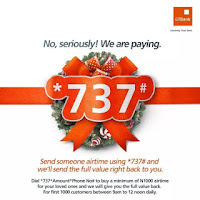 You get a free N1,000 airtime credited to your registered mobile number connected to your GTBank account. Recharge 10x and get 10k work of airtime from gtbank. get back the value of N1,000 or more and Get back 100% of your total recharge. Note: All customers can send airtime for a maximum number of five times, and when they do this, they receive #2000 five times making a total of #10000 airtime on their SIM. Remember: GTBank Airtime Promo gives additional 100% airtime bonus to the first 2000 Customers of the day. Dont forget that the offer is for first 1,000 customers between 9AM and 12none daily, this means first come first served condition is applied to it.